The life and times of country icon Johnny Cash, who died in September 2003 at the age of 71 and was admiringly known as the “Man in Black,” has not only surfaced on the silver screen in the biopic film “Walk the Line,” but also in the form of a new album featuring songs that span his entire career from 1955 to 2003. 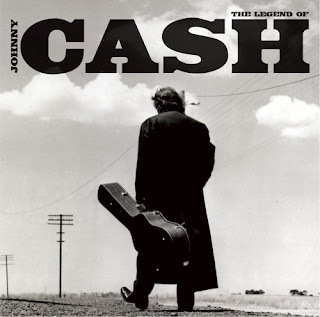 The 21-track disc and 16-page set of liner notes showcases Cash’s prolific career with songs like “Folsom Prison Blues,” “I Walk the Line,” “Ring of Fire,” “I’ve Been Everywhere” and the tune “The Wanderer” - a duet with U2 and taken off the group’s album “Zooropa.” The new Cash collection, which came out in late October, is a preview to the new film “Walk the Line” due out this week starring Joaquin Phoenix and Reese Witherspoon. Cash is famous for his smoky baritone voice and writing songs with bare acoustic guitar lines and combined elements of not only country but rock ’n’ roll and folk. Cash was born and raised in Arkansas, and began writing his own songs at the age of 12. Following his college graduation, he enlisted in the Air Force at the onset of the Korean War and it was then that he bought his first guitar. He later left the Air Force, married a woman from Texas in the mid-1950s and moved to Memphis. Cash signed with Sun Records and the label’s founder billed him with the first name “Johnny” which annoyed Cash because he thought it sounded too young. Cash’s classic hit “Folsom Prison Blues” and “I Walk the Line” ranked in the country Top 5 and No. 1, respectively, and some of his hits crossed over in the pop music arena. He wore all black when he performed, earning his famed nickname. Cash eventually left Sun Records and signed with Columbia Records in 1958. With a continuous influx of hits and playing about 300 shows each year, Cash began taking amphetamines to keep up with his grueling schedule. His career went downhill with his increase in drug use. By 1963, Cash had moved to New York City and had a few run-ins with the law. Cash got back on top with the song he co-wrote with June Carter, “Ring of Fire.” His bout with drugs publicly sprang up again when he was arrested in Texas for trying to smuggle in amphetamines in his guitar case. His wife later divorced him and he then became close friends with Carter, whom he eventually married and who helped him kick his habit. In 1963, Cash released his most recognizable album, a live recording at Folsom Prison, and over the years he has recorded with Bob Dylan, performed for President Richard Nixon and starred with Kirk Douglas in the film “Gunfight.” His wife Carter Cash died in May 2003 and Cash died four months later of complications from Diabetes. “The Legend of Johnny Cash” is a single disc treasure that reflects a series of hits from a longtime career without the price of a box set. It is a smart buy for both the Cash aficionados and the novice listeners.